Home > 2016 > 05/23 > Slicing and Dicing the Jets: Where did the goals come from and go? Slicing and Dicing the Jets: Where did the goals come from and go? The Winnipeg Jets missed the playoffs for the fourth time in five seasons since the move to Manitoba, and the 14th time over 16 seasons over franchise history. The season does not end for us though at Jets Nations. Welcome to our series where we take an analytical approach, dissecting what went wrong with the Jets 2015-2016 season and how to improve the team for next year. We introduce our series with comparing the Jets 2015-2016 season from the 2014-2015 season. The 2014-2015 season was pretty exciting one for Jets’ fans. It marked the first time the Jets made it to the post-season and fans were hoping it to be a sign of the times to come. The Jets after all had a pretty good showing. Despite barely scratching into the playoffs there was a lot of promise. The core of the team was mostly the same. The Jets were one of the better 5v5 shot and goal differential teams in the NHL. With a mediocre penalty kill, poor power play, and league worst penalty differential, there was still a lot of room to move up. The next year started off promising with the team starting off with an 8-4-1 record… and then they crashed. What happened? Where did the goals go? Simply put hockey is a goal scoring contest. At it’s simplest level it is about how effectively one team outscores its opposition. The Jets goal differential fell by 43 goals, from a solid +19 to a -24. On average one would expect the average NHL team to lose 8.6 wins from this. Sure enough, the Jets picked up 8 fewer wins than the season prior. I broke up the Jets performance into three situations (5v5, Power Play, and Penalty Kill) and then looked at multiple factors within those situations (shot volume, goal conversion, and TOI). I then looked to see how many goals the Jets’ 2014-2015 goal differential would have changed by if you changed only that particular statistic to the Jets’ 2015-2016 performance, and held all other variables constant. Left is ordered by statistic to keep each situation similar, while right is ordered in terms of goal differential impact. 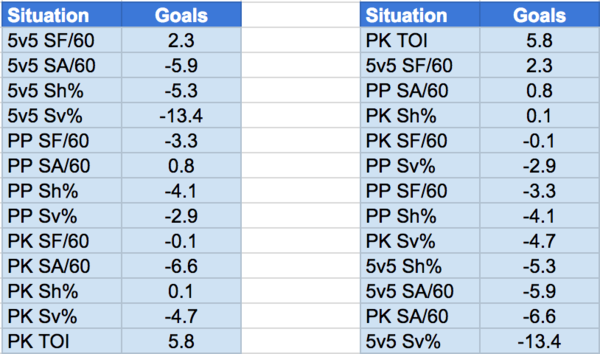 The sum of all these impacts works out to -37.1, which is only 5.9 goals off of the Jets true drop of of 43 goals. Not bad considering how many factors are missing. There were some areas of improvement. The Jets improved their penalty differential substantially, with a reduction in short handed ice time being worth about 6 goals against less. The Jets also generated about 2 goals worth more in generating 5v5 shot volume per minute, and their power play allowed about one goal worth of shots against less. After that though it looks a bit bleak. The short version is that the Jets could have done a lot better in quite a few areas. The Jets’ defensive game on penalty kill and 5v5 combined for about 13 more goals against. Jets goaltending in all situations fell by about 22 goals, about half of the Jets’ total drop. The Jets shooting percentage on the power play and 5v5 hurt the team by about nine goals, while the Jets shot volume on the power play (that was bad to begin with) worsened by three goals. All-in-all it was a tough fallout in performance leading to a tough year. While an influx in talent, some hopeful rebound years, and better goaltending the Jets’ should improve next season, but will it be enough to push the team back into the playoff picture? You neglected to mention the 1 common X factor that’s missing in all of your above equations Garret. You have a captain, who by all accounts didn’t want to be in Wpg. So by default he is forced to play on starting in October. You think his negative influence would effect anything positive coming from that dressing room ? You think the players didn’t ask if he was actually turning down $36 mil? And with Buff not signed, and rumoured to be on the trading block, what cohesiveness could be gleaned from an unknown future ? Signing Buff and removing Ladd from the equation sparked the team but it was much too late. Now ask yourself…what kind of management would do that to their players ? Is this an example of applying the “Long Term Solution” ? Didn’t want to be in WPG? There were no accounts of that. Also, what you are talking about is WHYs things happen, not HOW much something impacted the results. NO accounts of THAT ?? You can count right ? Say no 36 million x and what does it mean…?…MAYBE… !? “HOW much” Ladd impacted the results we’ll NEVER know but he DEFINITELY impacted them. How secure do the rookies feel when they KNOW their..ahem..captain wants out ? Morris are you arguing that Pav & Hutch were so upset about Ladd possibly leaving that their save % dropped so much it resulted in them letting 16.3 more goals compared to last year? I would have thought guys part of the “core” like Wheeler would have been rattled by their BFF leaving? Instead, Wheeler had a career year. But as you so clearly argue “HOW much” Ladd impacted the results we’ll NEVER know but he DEFINITELY impacted them”. Anyway, excellent piece Garret. Interesting to see less time on the PK resulted in almost 6 less goals against. I take away from this that if the Jets fix goaltending, get Stuart off PK, and shooting % regresses to the mean, then the Jets might be a bubble team for playoffs. Someone thinking that a deal isn’t the best possible deal they could get is not the same as not wanting to be somewhere. There are no accounts of Ladd not wanting to be out of Winnipeg. You are making some big assumptions. I was measuring where shots and goals differ from the year prior. You said I missed Ladd, but Ladd was not one of the situations where shots and goals differed from last year. What you were talking about is *possible* reason WHY they differed, which this article has nothing to do with. IE: You are saying something is missing in the article, but what you say is missing is on a subject the article in question is not even attempting to discuss. Just as there would be other reasons (besides statistical analysis) that would lead to a success. Andrew Ladd did NOT want to be in Wpg. This is what a home-boy would do? ? I think you are reading far too much into a few comments he made to reporters. What was he supposed to say in Chicago? No they can’t afford me, I don’t want to play here? Wow, I really hope that isn’t my childhood idle Morris Lukowich actually writing those comments and screaming at all of us in ALL CAPS. I’ll be crushed if that really is you Mr. Lukowich…. say it ain’t so!! I just POINT out the obvious and shake my head when I have to. You want me to sign your pogo stick ? What a decidedly unpleasant man you are. I would have hoped for a bit more class and decorum on a column dedicated to looking at the statistics behind the game of hockey, but apparently nowhere on the internet is safe. Garret, appreciated the article, as always. You’re my favourite columnist on JetsNation. Keep up the good work. Hopefully next year we see an improvement in goaltending. It will be interesting with the possible infusion two or three more rookies (Connor, Laine, possibly Morrissey) I will be curioius to see how our team develops and grows. Solid skill upgrades but It may take time to get them playing cohesively. I believe good times are coming but until they learn to play within the system and with structure I am guessing their might be some more growing pains.